Jayne Southwick Cool (b. 1947) is a poet and composer/arranger of hymns, works for brass, woodwinds, handbells, organ, piano, and mixed and children’s choirs. 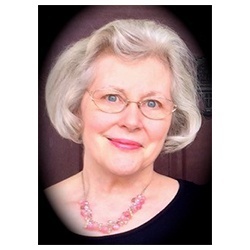 She is retired from the position of Director of Music at Bethel Lutheran Church in Middleburg Heights, OH, where she served for over twenty-five years. She taught classroom music and directed bands and choirs in both public and parochial schools; she was a private instructor on French horn for many years. She served on the Worship Committee of The Northeastern Ohio Synod of the ELCA for six years (three as chairperson). She holds a Bachelor of Music Education degree from Baldwin-Wallace Conservatory, Berea, OH. Graduate studies include work at Trinity Seminary, Kent State University, The University of Akron, Oberlin College, and Baldwin-Wallace College.